This weeks color in the 52 weeks of color challenge is green. I decided to go with a darker shade. The dress is from LeLutka and the shoes are Maitreya. Check below the pics for the rest of the details! It’s week six of the 52 weeks of color blogger challenge This week is Yellow! I had a lot more items tagged with “yellow” in my inventory than I realized. Yellow is such a happy color (when it isn’t a Coldplay song) and that is the reason I tried to do something more lively this week. Take a peek! This weeks color was Sepia… and it was rather difficult. I mostly used different shades of brown though I do have orange lippy on and some random items inspired by the holidays as well. 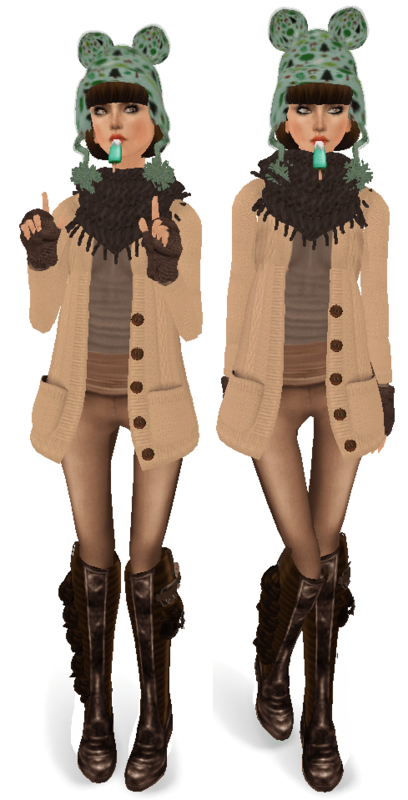 I’m not a fan of browns/yellows/orange tones in RL at ALL.. but in SL it’s easy to make any color compliment your skintone.. . Whew! On to the photos!